Dates, biggest discounts, tips, our best guess on the Steam Spring Sale 2019 date, and more. Steam Sale dates are a guarded secret, but they always seem to slip out before the sales actually happen. Valve tries to keep the precise details of its Steam sales quiet. Information is shared with developers and partners, but if customers knew exactly when a sale was going to drop, many would simply wait for the discounts. Fortunately Steam sales happen fairly consistently across the year, and there seem to be more of them all the time, including snap sales and publisher bundles. The seasonal sales offer the broadest, deepest price cuts of the lot, and they tend to occur during Spring, Summer, Autumn and Winter. Read on for more information on when Steam sales tend to occur, and our best guess on the next Steam sale date in 2019. The next Steam sale will likely be the Steam Spring Sale 2019. There is no confirmed date for this yet, but our best guess is it'll happen on Thursday, May 23—scroll down for more of our reasoning on why we think that's the case. When do Steam sales usually happen? Steam sales occur at regular times of the year. By looking back at Steam sale dates from the last few years we can extrapolate and predict the dates of each Steam sale in 2018 and beyond. Steam sales tend to start at at 6pm BST/1pm EDT/10am PDT on the third or fourth Thursday of their respective month, with the exception of Autumn Black Friday sales, which have landed on Wednesdays in the last few years. Knowing this we can guess (and that's all this is) the following dates for Steam sales in 2019. Again, these dates aren't confirmed, but since 2016 the sales have followed this pattern. How long do Steam sales last? The Summer and Winter sales are the big ones. They tend to last two weeks (ish). The Spring and Black Friday Autumn sales last about one week. Which is the best Steam Sale? 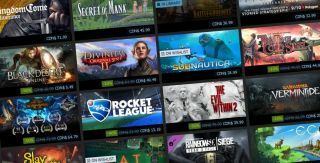 In the past, when we've rounded up the best Steam deals ever, we've seen some remarkable discounts. Valve's Portal 2 went from $50 to $5 in the Summer Sale a year after release. Whenever you see a game you might want, add it to your wishlist. You will receive notifications when wishlisted games are on sale and having a list makes it easier to resist buying unlisted games for the sake of it on impulse. If a game is not on your list, do you really want it? Looking for a way to quickly fill up your wishlist? Check out our round up of the top 100 games you can play on PC today. Here are 100 other smaller games judged by algorithm to be the best hidden gems on Steam. And these are the best PC games we recommend right now. Publisher bundles can knock lots of money off entire series or catalogues. If you want to buy an individual Hitman game then you might want to check for a series bundle—chances are you could get all of the games for not much more. Expansions can often feel a little overpriced, especially if they're only adding a few hours of new stuff to your game. In Steam sales you can pick up a lot of DLC for just a few bucks and reinvigorate games in your back catalogue. You can get big percentage discounts on big budget games in the major Steam Sales, but even with a hefty trim those games can still cost 20 or 30 bucks. If you want to maximise the amount of play time you get out of a Steam sale, quality indie games go down to dollars, and even cents. If you're not going to play a game before the next big Steam sale rolls around, you might as well wait. Chances are the discounts will increase as the annual sales roll by, all while you're clearing your backlog. It's also much easier to wait on a purchase these days because there are no daily or flash deals. If you see a discount, you know that's going to be stable until the end of the sale so you can wait a few days to make a decision. It's not uncommon for a publisher to showcase all of its products on sale during a weekend, an event which is usually marked by a homepage takeover of sorts. Look out for these if you're after a blockbuster game at a better price. Check out our guide on where to buy PC games, if you want more places to shop around.